ok i have the pics up now--yall like those Hehe. it is feed by the return heater hose--(it is a non thermostatically fed system) and it returns to the thermostat housing as the heater hose normally do. homemade hangers from aluminum stock available at lowes/homedepo etc. 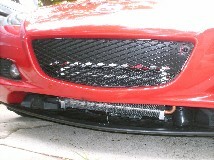 mounts to the front bumper support. upgraded water pump(mazmarts) and a 60/40 coolant blend in the summer months. Stock thermostat unless the temps are in the high 90's and i am headed to the track--i then have a custom 180 thermostat barrell type that i use. Mazmart is reportedly thinking about building a stock replacement thermostat that fully opens at 180F--but not yet. removed the front rotory symbol for better airflow. youre temps coolant and oil will be fine. airflow is the key and this puts the cooler right where it is needed. for those that dont want to do the work etc--Pettit is going to sell a kit almost like this but it is mounted in the airdam belly pan. ^ This is a great idea - if you want the car to run even hotter. You take a smallish rad, saturate it with hot water and then us it to simultaneously reduce airflow to the main rad and heat that reduced airflow up to the temp of the coolant in the first place. The 70/30 cooling comment is still missing the point. The oil cooling system is responsible for shedding a smaller amount of heat than the rad because of the thermal properties of oil versus water. Oil is slow to give up its heat. If the oil temps rise to coolant overheat temps, you will have an impossible chore before you in getting the water temps under control. However, if you get the oil temps down to as close as possible to minimum operating temperature, keeping coolant temps under control is a breeze. MM dude --give me a break. Wait a minute--no dont give me a break--dont want one, dont expect one. I dont even expect any objectivity. Bottom line--this works for me. My data proves this. Not only do I put this small cooler in front but the pettit a/w intercoolers are behind it--then the a/c condenser is behind that---then the radiator. Unfortunately, they contradict quite a few other datapoints gathered by other vehicles in the field. No one is calling you a liar. You are just misguided. Exactly! Thanks for explaining it better than I even approached. I'd like to ask a couple questions...and I'm asking for arguements one way or the other. In our car, which system dissapates more heat (BTUs)? The oil system or water system? I've never seen any data, and it would be helpful. We have a nice radiator, but more expense was taken cooling oil with dual oil coolers. Does that mean more benefit would be gained from more oil cooling 1st over water? Let's say yes. Would simply improving the air flow provide more improvement than trying to add yet more radiator? How about removing the inside fender well plastic piece in the front. It's a separate piece, just takes a small screwdriver and 5 minutes. Would that freeflow matter enough on track events? 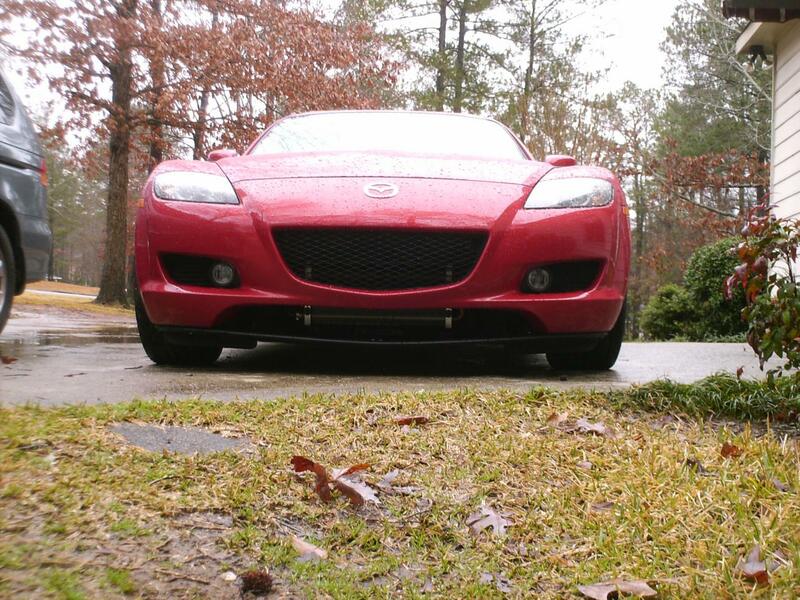 What happens when you say use a Mazdaspeed style bumper? Does that increase airflow - both water and oil significantly enough to matter. Could that be the easiest 1st cooling mod? It would be ideal to once and for all determine some system of improvement, hopefully passive and easy not requiring additional plumbing $$$. So I'm thinking, MS bumper, remove/redesign the rear fender well air outlet panel would do the trick? Is that crazy easy or simplistic? I think yes, but the bigger openings increase the drag of the car, which of course don't relate so much to the overheating problem. What are the average oil temps in an FC, FD, when the engine hot? Is there a huge difference between the Renesis, and them? explaining what? its what everyone is dealing with when they buy a Rotary. Think of it like this; when you **** with oil it will hold a temp of oh lets just say 400F. Reuse that oil and it will hold a temp of oh 200F. This is just a example. But you get the point. Ok now that same gos for brake fluid. People that dont know this will just say uhh I never heard of that. But know you have and know you should start thinking about it and how all things liquid brake down over time with heat and dont block heat like they use to the first time they where used. Thats why I stay ontop of my oil changes and flush it. The drag will be so minimal at rule road speeds its no big deal. However at high speeds the charged air is will find a way out of the engine bay. Just look into how the NASCAR's front, hood, and fenders are set up. Also open wheel race cars engines are closed in. All Rotarys run hot and drink oil and gas lol but think of it like this; Oil temps: If 30c=86f when moded FD's sit in traffic in 86f they get up to 194f. Now depending on your driving freeway driving will be about 140f to 194f. I think water temps will be about 18 degrees more. Keep in mind all this is give or take and based on location and mods. But you get a good idea. 1. In our car, which system dissapates more heat (BTUs)? The oil system or water system? I've never seen any data, and it would be helpful. 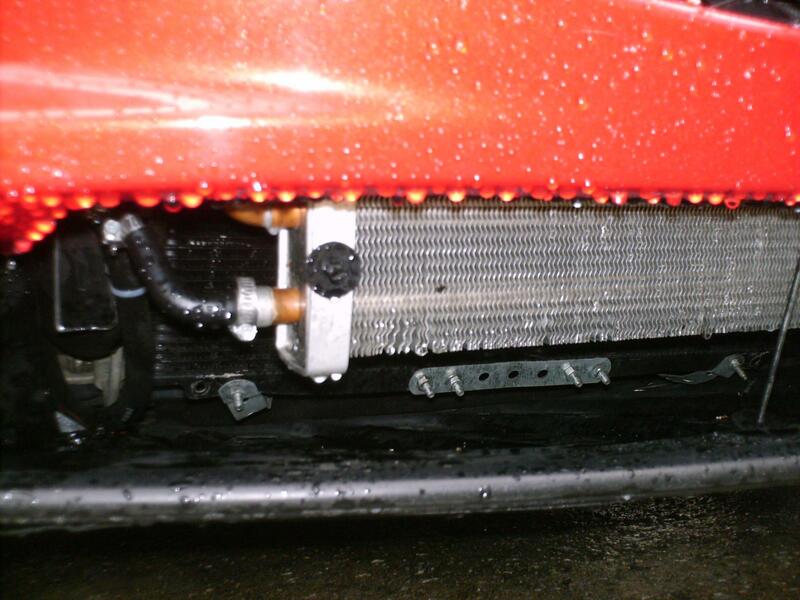 2.We have a nice radiator, but more expense was taken cooling oil with dual oil coolers. Does that mean more benefit would be gained from more oil cooling 1st over water? 3.Let's say yes. Would simply improving the air flow provide more improvement than trying to add yet more radiator? How about removing the inside fender well plastic piece in the front. It's a separate piece, just takes a small screwdriver and 5 minutes. Would that freeflow matter enough on track events? 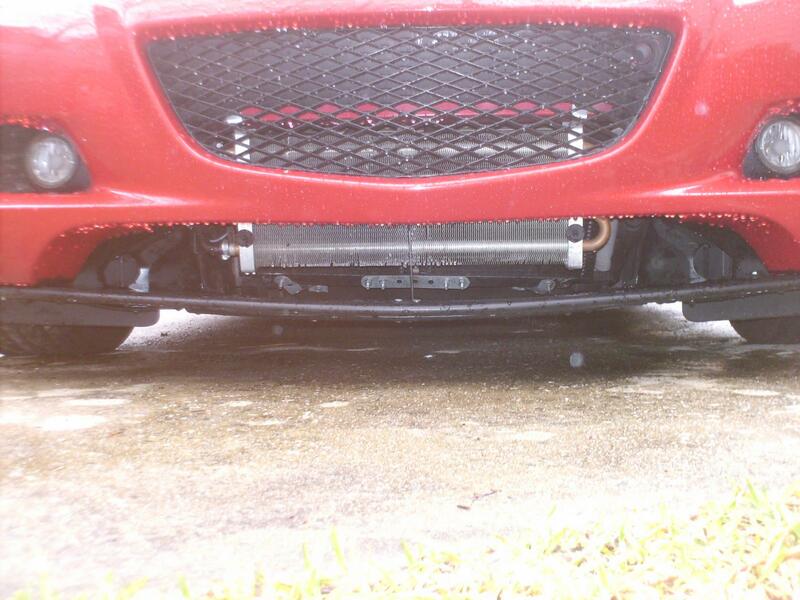 4.What happens when you say use a Mazdaspeed style bumper? Does that increase airflow - both water and oil significantly enough to matter. Could that be the easiest 1st cooling mod? 6.So I'm thinking, MS bumper, remove/redesign the rear fender well air outlet panel would do the trick? Is that crazy easy or simplistic? 2. No big deal. Lots of exotic cars have this set up IE: 911. Second part of this question ref back to question one. 3. Yes and no. See I removed that plastic's that are right behind my oil coolers. However that dont mean more air is going to flow better throgh the oil coolers. What to keep you stuff cool? buy and use a radiator comb to keep your fins straight. 4. Yes the MS front will increase air flow. Will it cool the water significantly? no and no. 6. Good luck but I can tell you this; I dont have the MS front, plan on gettong one soon, I did remove the plastic's behind the oil coolers, gaped my hood and did the TB by pass. All 3 will help you out a lot. Just doing one. I dont know. Holy crap that was a lot of nonsense. Whoa, there's some seriously bad information going on in this thread. Being in one of the hottest climates in the US, I've spent a lot of time looking into cooling so this is a subject, thankfully, I've had a lot of experience with. Let's get some facts straight. Oil is NOT the primary heat reducing agent in the coolant system. If that was the case you'd be using oil and not water to cool the motor. The difference is that oil will absorb about 1/3 of the engine heat and thus needed to have coolers in order to keep oil temperatures under control. Oil temperature is the most important temperature of the two however. If you had 230 degree water temps with 260 degree oil temps you're motor is about to blow if it hasn't blown already. If you have 230 degree oil temps but your water temps are 260 degrees you're still in a danger zone regarding detonation but your motor's chances of survival are greater than the previous situation. One of the best methods I've seen employed is using an oil cooler from a 1st gen RX7 and placing it in line with the other 2 coolers. The oil lines simply link one cooler to the other which are placed in series. This would add extra cooling capacity as well as increasing the total amount of oil in the system. I've also been running the Greddy oil pan for quite a while. It's cooling capability at idle is probably not very good being a foot off the ground but it increases the oil capacity of the RX8 by 1.5 quarts which does help. I had a rare opportunity to race my RX8 on the track when it was about 105 degrees outside and about 140 degrees on the track itself. I was able to stay full throttle during the training session much longer than most vehicles including the other RX8's. The problem was once the oil system became heat saturated my racing session was over. Oil doesn't give up heat easily and even after taking it easy for a couple laps the oil system didn't recover but a few degrees. The water system came right back into safe zones however. Other problems involve sealing the area around the radiator. Too much cold air can escape around the sides since the resistance is less. Frankly I find the notion of secondary radiators a waste of time. There are radiators on the market which are large enough to do the job of cooling the RX8 and using a secondary is totally unnecessary except maybe as a cost saving measure. I had to come back here. People who know me, know that i dont lie about this stuff and I freely share with others whatever I find out. the radiator on our cars would probably be ok if it was directed more into the airflow in a more direct manner, but it is not. The rear of the radiator is also partially blocked by the battery box and aircleaner stuff. heck there is poor airflow through it in comparison with an upright rad directly in the airstream. I will challange anyone that says this set up I have does not work in my area. The desert area folks have a totally differant enviroment and this mod may not do them much good--they dont have much humidity in the air to work with and humidity is a good thing when it comes to cooling. Their approach has to be different. I have also ran on a 105F day and the pavement measured at 140F--alternator got so hot that the edges of the belt actually melted. engine coolant temps at MAX when i had to hold the car for a little over 7K was at 204---oil temps at 196. Once i was able to vary rpms again temps stabilized at 194-198--oil temps the same. If anyone has coolant temps of 260F with this engine then you have BIG probs. Before I did this mod, on track, oil temps would get hotter than coolant--i have seen oil temps at 230F while coolant was at 220--before my mod. Most of the rx8's that have gauges that run track in my area will tell you the same--its not the usual case but on red flag times etc it does happen. My street temps are in the 170-180F--traffic doesnt matter. if setting still with the a/c on and a hot high 90F day it will go to a low 190 and then cool off when you can move again. I disagree that our oil temps are the most important in preventing damage to this engine. I will also challange anyone to produce an oil temp of 250+ in our cars while the coolant temp is at less than 200F. Why?---because they work together--and the coolant has a much more profound affect on the overall temps of the engine. It will not allow that much of a difference between the too. If you coolant is already at 230 --again you have problems. Airflow is a component of cooling that cannot be ignored. This was the easiest and the less expensive way that I could think off to fix my problem. by the way--i do not want this to sound like the BHR radiator doesnt work. I know some people who have one and are vrey staitsfied with it. It is a much better design than oem and has a much better cooling capacity than the oem. Some people would not like to do to their car what i have. The BHR rad is a great solution that appears oem in the install etc. I would NOT endorse the Kyroso one. Those are the only 2 rads that I know anything about. Their may be other good ones out there. People get the wrong ideas easliy and I just wanted to clarify. Why are you hung up on the idea that someone thinks you are lying? All I'm saying is one data point doesn't make a sample. No one is discrediting your findings. Unfortunately, they run contrary to the larger body of data, that's all. explaining what? its what everyone is dealing with when they buy a Rotary. Think of it like this; when you **** with oil it will hold a temp of oh lets just say 400F. Reuse that oil and it will hold a temp of oh 200F. This is just a example. But you get the point. And with vegetable oils, the loss of temperature holding is due to contamination of the oil stock, with food stock. Ok now that same gos for brake fluid. People that dont know this will just say uhh I never heard of that. But know you have and know you should start thinking about it and how all things liquid brake down over time with heat and dont block heat like they use to the first time they where used. Thats why I stay ontop of my oil changes and flush it. Hmm, actually again, you seem to be missing that the only reason that brake fluids break down is again due to contamination usually by absorption of water. The boiling point lowering on brake fluid is not due to repeated heat cycles, but rather absorption of moisture which lowers the fluids capability to resist boiling. Of course most DOT3,4 and 5.1 brake fluids are designed to absorb water to help reduce corrosion, so regular changes are required to maintain the anti-boil properties and remove the contamination from water, so that full brake compression is possible with limited to no fluid compression. This is why you change your brake fluid every 2 years. To remove the absorbed moisture from the system. Oil viscosity break down on the other hand comes from contamination (blow by products) and shear and heat. So not sure why you are bringing that up. Clearly every example you used, well they don't follow anything logical. So getting back to the point, reduce the heat of the oil, and you reduce the temp battle in the engine between the oil and the water, and you reduce the possibility of viscosity break down from heat. Umm okay, then explain how you can run 100 miles without a oil cooler, but can't run 100 miles without a radiator. Clearly every example you used, well they don't follow anything logical. Ok it was a bad example but you get my point. They breakdown over time with heat. You know as well as I do that oil dont last for ever so dont try to pull that bull **** on me. No. Why dont you and Jeff tell me. You know thats bull ****. You can only run the quarter mile with out any oil coolers on a RX-7 and RX-8 has about the same heat issues as they do. Last edited by DOMINION; 03-02-2009 at 05:24 PM. ok-- my findings are contrary to a large body of data -- what data? I dont know of but one other car that has done this (by the way he had just as good as an affect as I)--so what data is being referred to? I can answer myself-- because there is no other data than what we 2 have in evaluating this modification. You have to compare apples to apples. It is what it is. Thats all. I have to apologize to the originator of this thread--sorry it got turned around here. You had a good question and maybe we helped answering some of it? I will pay you back the money it cost you to do it. Now i will have to see the car and see the data--thats why i limit it to Georgia. Someone come prove me wrong. The burden of proof always lies with the one asserting the claim. Well actually if you could keep the oil clean and in normal operating temps, it would last forever (other than what is lost by seal seepage and use through the MOP). But the base stock pretty much would indeed last for ever, if you could keep the oil clean and in operating temps. The problem of course is the same problem that happens in your cooking oil... contamination. The acids and gasoline and coolant that all seep into the oil through the combustion process contaminates the oil. Those are what the detergents in most oils are used for, but when they get used up, then it is your oil alone doing the work. If you could filter these out however, then you could use the oil pretty much forever. But the average car oil filter is just about useless for this part of cleaning/filtering. This is what happens to your oil when you drop it off at your local auto parts store after an oil change and they recycle it. It sent to a refinery, gets cleaned, new additives are added and it is mixed up and sold back to you for use in your car all over again. * Now Mobil 1 claims no additive package in their 10W30, so in theory using that oil you wouldn't even have to worry about the viscosity additives breaking down.